This post entry provides a detailed description of how to port the NFC Reader Library to Kinetis K64F MCU. It is used a real porting example exercise to show the steps required to adapt the NFC Reader Library to a sample target MCU. The goal of this post is to serve as a guide for software developers requiring to port the NFC Reader Library to their MCU of choice for their designs. It is supported in multiple design environments and platforms and it has been developed with a strong focus on portability. All our NFC frontends (CLRC663 plus PN5180) and PN7462 NFC controller. And built-in MCU support for LPC1769, LPC11U68, FRDM-K82F and Raspberry Pi. In addition, the release includes several examples to get familiar with the library and which can be used as reference for your developments and, it is also included an HTLM-based API documentation for all the components, which is generated from source-code annotations. The Application Layer (AL), which implements the command sets to interact with MIFARE cards and NFC tags. The NFC activity, which implements a configurable Discovery loop for the detection of contactless cards, NFC tags or other NFC devices. Next to it, the HCE and P2P components, for the emulation of Type 4 tags and P2P data exchange respectively. The protocol abstraction layer (PAL), which contains the RF protocol implementation of the ISO14443, Felica, vicinity and NFC standards. One level down, the hardware abstraction layer (HAL), which implements the drivers for controlling the NFC frontends RF interface and capabilities. Below, the Driver Abstraction Layer (DAL), newly introduced in the latest release, which implements the GPIO pinning, the timer configuration and the physical interface (BAL) between the host MCU and the reader IC. The eleven software examples, the Application Layer (AL) and the Protocol Abstraction Layer (PAL) are HW-independent, so that can be used on top of any NFC frontend. The the Application Layer (AL), the Protocol Abstraction Layer (PAL) and the Hardware Abstraction Layer (HAL) are platform-independent, so that can run in any MCU without any additional change. In case the reader MCU is part of the built-in support, the examples can be directly imported and executed straight forward. On the other hand, in case the reader MCU is not supported by default, the major advantage is that only adaptations in the DAL and OSAL layers are required, while the rest of the layers can be used without any modification. Prearing the HW (i.e the pining between the Kinetis and the NFC reader board). Setting up the development environment (i.e workspace). Performing some code modifications in the DAL and application code for adding Kinetis K64F support. A FRDM-K64F board (Kinetis K64F) as host MCU, used to load and run the application logic. Six resistors from the board need to be removed. These are highlighted in red. Use the SPI pin connectors available on the left hand side, on the board edge. We use the Kinetis K64F jumper 2 pin line for the MOSI, MISO, chip select and clock lines of the SPI communication. The IRQ, interface selection and reset pins of CLRC663 plus are connected in jumper 1 pin line. And, one ground pin used for reference. Therefore no complex HW manipulation was required since all interfaces are easily accessible via dedicated headers or test points. Once the HW connection is prepared, we can move to setting up the development environment and workspace. Click download on the NFC Reader Library for Kinetis K82Fpackage. 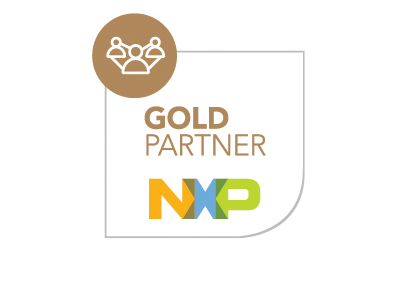 Navigate to www.mcuxpresso.nxp.com and select SDK builder option. Then, use the drop-down menus to customize your SDK configuration, middleware and optional software components be included in the package. In a few minutes, you will receive an email with a link to download the SDK package, very similar to the one showed in the figure below. Next step to configure the development environment is to import the library package in the workspace. The easiest way is to use the Quick Start Panel on the left hand side. Then, browse the library package in your file system. Click Finish to import it all to your workspace. Import the SDK into the workspace and link it with the software examples. It will appear as another folder in the project explorer window. At this point we have the hardware and the workspace for software development ready. In this step, we will start porting the NfcrdlibEx1_BasicDiscoveryLoop software example provided as part of the NFC Reader Library release. In the right-hand panel, we can observe the corresponding settings for K82F micro. The left figure indicates the project configuration settings used by the default SW example prepared for K82F while the right figure indicates the final project configuration settings used by the SW example ported to K64F. After that, we need to change the compiler preprocessor settings, which can be found in C++Build > Settings. In the project examples of the NFC Reader Library, the conditional directives like #ifdef and #ifndef are used to include or exclude portions of the code from the actual compilation. The conditional codes are included in the program compilation only if the MACROs are defined in the project compiler preprocessor settings. In the left side we can see the defined macros for the original project. Among them, includes one which defines that the HW used is PN518 and K82F board. Therefore, in the ported project, we need to replace the macros corresponding to K82F with the new ones corresponding to K64F. For instance, the PHDRIVER_K64_CLRC663 macro includes in the compilation the files related to the new HW used in the ported project (for the board pin and GPIO config, SPI settings or timers). Precisely, these files are included inside BoardSelection.h file in the Driver Abstraction Layer (DAL). In the left-hand list, open “C++ Build” and Select “Settings”. In the right-hand pane, choose the “Includes” section. In the left figure, we see the compiler include paths for the K82F SDK of the original example. In the ported example, the K64F SDK sources will not yet compile since we did not tell the compiler about all the new include paths. Therefore, we need to add the new include paths pointing to the K64F SDK and put them into the MCUXpresso IDE project. In the right figure, you can see the paths we included for this purpose. Mainly, these paths reference to the board system init, board drivers, CMSIS files and debug utils. The last MCUXpresso settings to be changed is in the MCU Assembler. This can be found in the right-hand panel, choose the “MCU Assembler” and select “General”. In the original source code, a path is used to the K82F SDK. In the ported example, we just need to remove the previous include path and replace it with the corresponding one pointing to the K64F SDK in our workspace. So far, we have the HW, the development environment prepared and the project configuration settings changed. At this point, there are only a few code changes to be done before the porting is completed and the software example can be run in K64F. The init functions for timers and interrupts so they are correctly used by the application layer. In addition, we need to include the board, pin_mux and clock config files. Clicking the “Import SDK” example in the quick start menu > select the FRDM-K64F board. Each example application has its own unique copy of the board, pin mux, and clock config files that you can reuse for the porting (Note: this process could be different depending on the MCU used). The ph_NxpBuild_App.h, which links the board with the reader IC by enabling the CLRC663 plus module in the HAL layer. The ph_AppInit.h so that the board is initialized when the reader device boots. After following the previous steps, the source code is succesfully ported to K64F. The following video demonstrates the correct execution of the NfcrdlibEx1_BasicDiscoveryLoop example in FRDM-K64F host MCU connected to CLRC663 plus NFC frontend (CLEV6630B). The video includes a webcam, which records the HW, including all the witing wiring between the K64F and the CLRC663 plus antenna. After the code is built and compiled, the video shows how some tags are tapped to validate that the example is working as expected (tag’s UIDs are displayed in the MCUXpresso console). . Adapt the MCU drivers to the DAL layer in the NFC Reader Library. This typically includes: timers, interrupts, pining and host interface configuration between the NFC reader and host MCU sides. Adapt the OS layer (i.e. you might need to port the FreeRTOS or to your target OS platform). Adapt the source code examples: project settings (macros, include paths, MCU configuration) and perform the required code modifications (Code for HW initialization, board files, etc).